Is Amazon a disruptor or a distraction for the logistics industry? That was the main question I addressed during my keynote presentation at the SMC3 Connections Conference last month, one of the leading events for transportation and logistics professionals. And just last Friday, Amazon revealed Amazon One, it’s first branded cargo plane. Plenty has been written about the “Amazon Effect” in retail and how the company has rewritten many of the rules for success in the industry. Is Amazon planning to do the same in logistics? In 2015, Fulfillment by Amazon (FBA) shipped over one billion units on behalf of sellers. The number of active sellers using FBA grew more than 50% [to approx. 3 million sellers]. In Q4 2015, FBA units represented nearly 50% of total third-party units. Prime Now offers members one-hour delivery on an important subset of selection [and serves] members in more than 30 cities around the world. Prime has become an all-you-can-eat, physical-digital hybrid that members love. Membership grew 51% [in 2015] – including 47% growth in the U.S. and even faster internationally – and there are now tens of millions of members worldwide. Simply put, retailers that simply try to copy (or even outdo) Amazon by offering free and fast shipping are defending against the wrong thing. Delivery is a loss leader for Amazon (the company’s shipping costs exceeded shipping revenue by $5B in 2015), but Prime is another example of the whole being greater than the sum of its parts — with the whole including free movies, music, games, books, and much more, with the costs offset in part by higher overall spend from Prime members and the company’s profitable and fast-growing cloud computing service. Why is Amazon investing so heavily in expanding its logistics footprint and capabilities? Why should you care? What are the takeaways? What, if anything, should you do about it? Adrian’s response: Amazon wants to own and control the innovation cycle — from the front end of its operations (website) to its back end (order fulfillment, DC automation systems, and final delivery) — in a holistic and integrated manner. In essence, Amazon is taking the same “owning the ecosystem” strategy that Apple took in the computer industry. In short, I believe Amazon logistics strategy is a customer focused one: it’s not aiming to compete with entrenched players like UPS and FedEx (the capital costs required to match their networks would be too great); the company is investing in logistics not to deliver packages, but to keep raising the bar on delivering the best overall customer experience possible (which didn’t happen in December 2013 when UPS and others failed to deliver Christmas packages on time). For related commentary, see Keeping Control: What 3PLs Must Convince Their Customers. End-Customers Must Become the Center of Your Supply Chain Universe: How must you transform your supply chain processes, technology, resources, and relationships in response? Logistics Must Become a Competitive Weapon: Cost management is still important, but how can you leverage logistics to drive top-line growth and profits, increase market share, and improve customer service, experience, and loyalty? Last-Mile Delivery is Becoming New Logistics Battleground: See Walmart’s pilot tests with Uber, Lyft, and Deliv, and Schneider National’s recent acquisitions of last-mile service providers Watkins & Shepard and Lodeso. 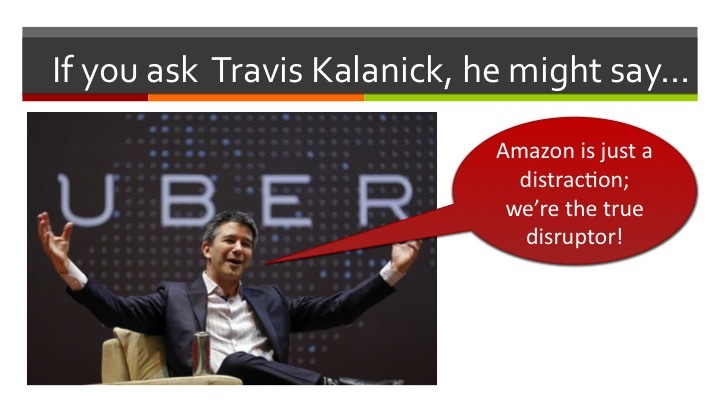 For related commentary, see How Big is the Same-Day Delivery Market? Logistics, Commerce, and Technology are Converging. In short, logistics services and technology are moving further upstream toward enabling and facilitating e-commerce. Crafting your own unique response to these trends, levering your strengths, assets, and resources, is the best path forward. Now, that’s a topic for a different day! What are your thoughts on this question? Why do you think Amazon investing so heavily in expanding its logistics footprint and capabilities? Do you agree with my response and takeaways? Who do you believe will have a bigger impact on logistics in the years ahead: Amazon, FedEx, UPS, or Uber? Post a comment and share your perspective!